For the larger local government district, see Metropolitan Borough of Solihull. Solihull (/ˈsɒlihʌl/, /ˈsoʊl-/ or /ˌsoʊliˈhʌl/) is a large town in the West Midlands, England with a population of 123,187 in the 2011 Census. Historically in Warwickshire, it is a part of the West Midlands conurbation. It is the largest town in, and administrative centre of, the larger Metropolitan Borough of Solihull, which itself has a population of 209,890. Solihull is situated 7.5 miles (12.1 km) southeast of Birmingham, 18 miles (29 km) northwest of Warwick and 110 miles (180 km) northwest of London. Solihull's name is commonly thought to have derived from the position of its parish church, St Alphege, on a 'soily' hill. The church was built on a hill of stiff red marl, which turned to sticky mud in wet weather. The town is noted for its historic architecture, which includes surviving examples of timber framed Tudor style houses and shops. The historic Solihull School dates from 1560 (although not on its present site). The red sandstone parish church of St. Alphege dates from a similar period and is a large and handsome example of English Gothic church architecture, with a traditional spire 168 feet (51 metres) high, making it visible from a great distance. It is located at the head of High Street and is a Grade I listed building. It was founded in about 1220 by Hugh de Oddingsell. A chantry chapel was also founded there by Sir William de Oddingsell in 1277 and the upper chapel in St Alphege was built for a chantry. Unlike nearby Birmingham, the Industrial Revolution largely passed Solihull by and until the 20th century Solihull remained a small market town. World War II also nearly passed Solihull by. Neighbouring Coventry and Birmingham were severely damaged by repeated German bombing raids but apart from some attacks on what is now the Land Rover plant, the airport and the local railway lines, Solihull escaped largely intact. In 1901, the population of the town was just 7,500. This growth was due to a number of factors including a large slum clearance programme in Birmingham, the development of the Rover car plant, the expansion of what was then Elmdon Airport into Birmingham International Airport and, perhaps most significantly, the release of large tracts of land for housing development attracting inward migration of new residents from across the UK. Until the early 1960s, the main high street remained much as it would have been in the late 19th century with several streets of Victorian terraced houses linking High Street with Warwick Road. The construction of the central shopping area known as Mell Square (named after W. Maurice Mell, the town clerk who planned the work) involved the demolition of properties in Mill Lane and Drury Lane, some of which were several hundred years old, together with that of the large Victorian Congregational Church that had stood on the corner of Union Street and Warwick Road. On the right along High Street from St Alphege's Church porch is one of the town's oldest landmarks, The George, which dates from the 16th century. It is now called the Ramada Jarvis Hotel. On 23 November 1981, an F0/T1 tornado touched down in nearby Shirley. The tornado later moved over Solihull town centre, causing some damage to the town centre before dissipating. Arden Golf Club, Solihull, (now defunct) was founded in 1891. The course was still appearing on maps into the 1930s. In 1964, Solihull became a county borough and on this occasion the Queen bestowed the honour. In 1974, the Solihull county borough was merged with the rural district surrounding Meriden to form the Metropolitan Borough of Solihull. This also includes the districts known as Shirley, Knowle, Dorridge, Balsall Common, Castle Bromwich and Chelmsley Wood. The member of parliament for the Solihull constituency is Conservative Julian Knight, who won his seat in 2015. There are 17 wards in Solihull; Olton, Knowle, Dorridge, Silhill, Blythe, Meriden, Elmdon, Lyndon, Smith's Wood, Chelmsley Wood, Hockley Heath, St. Alphege, Shirley West, Shirley East, Shirley South, Kingshurst & Fordbridge, Castle Bromwich and Bickenhill. Each ward is represented by three councillors at Solihull Metropolitan Borough Council, making a total of 51 councillors. The mayor is elected by the Council and is currently (2017–18) Stuart Davis of the Conservative Party. Solihull has no university, but there are seven universities within 16 mi (26 km) of the town; five in Birmingham and two in Coventry. However, Solihull College, formerly known as the Solihull College of Technology, incorporates a University Centre which offers several foundation degree and full degree courses, particularly in technical subject areas such as computer sciences and engineering. As yet it has not applied to attain university college status. There is also a sixth form college located on the outskirts of the town centre. This is known as the Sixth Form College, Solihull. Solihull School is an independent school and is located on Warwick Road near the centre of the town. It was founded in 1560 and celebrated its 450th anniversary in 2010. Solihull had a 'Wave 1' proposal of the Building Schools for the Future investment programme approved. They were awarded over £80 million to transform six schools in the north of the borough in December 2004. As a result of the funding, there will be six new schools constructed within seven years. The school curriculum will be redesigned as well as a further £6 million investment in managed ICT services. The six schools to be rebuilt are Park Hall, Smith's Wood, Archbishop Grimshaw, Lanchester Special School and Forest Oak and Merstone special schools. Forest Oak and Merstone have been already rebuilt on one site. Lanchester, Park Hall and Smith's Wood have been built by BAM PPP, under 'Private Finance Initiative'. Archbishop Grimshaw has been built by BAM PPP under a traditional contract. A number of main roads pass through Solihull including the A41 Birmingham to Warwick road and the A34 Birmingham to Stratford road. The M42 and the M40 both pass through Solihull and provide very rapid links to Oxford and London and to the rest of the motorway network surrounding the West Midlands. Birmingham Airport is located in Solihull. Solihull railway station is on the former Great Western Railway line from Birmingham Snow Hill station to London Paddington although trains now run along the Chiltern Main Line terminating at London Marylebone. Solihull railway station was first built on a very grand scale, with 2 island platforms complete with nearly full length canopies, and a large goods yard, boasting space for some 200+ waggons; the yard was equipped with a loading dock, goods shed and large crane. Solihull was also rare in being only one of a handful of stations in the area to have a goods relief line. Other railway links are provided on the West Coast Main Line, as Birmingham International railway station lies within the borough's boundaries and offers frequent express connections to London. Express train services through Solihull are now run by Chiltern Railways and local services by West Midlands Railway. The Grand Union Canal passes across Solihull, coming within 1 mi (1.6 km) of the town centre and linking the town to the River Thames in London. Local bus services are provided largely by National Express West Midlands from their Yardley Wood and Acocks Green depots in south and southeast Birmingham respectively. Solihull offers a variety of shopping facilities. It has an open-air 1960s-style shopping centre called Mell Square which was constructed following the demolition of several terraces of Victorian houses and the original Solihull Congregational Church. In recent years, the town has undergone much development, and High Street has been pedestrianised since 1994. On 2 July 2002, a large new shopping centre, Touchwood, was opened by the Queen. Solihull is the home of the four-wheel-drive car manufacturer Land Rover's main production plant (situated east of the Lode Heath district) and a range of other major companies. The village of Meriden was the famous home of the Triumph motorbike factory from 1942-1983. The former home of retail bakers Three Cooks, after it was brought out of administration in 2006, the new company Cooks the Bakery retains its HQ in Solihull. Other major companies headquartered in Solihull include pub company Enterprise Inns, mortgage and personal loan provider Paragon, and retail and commercial bank Secure Trust Bank. The National Exhibition Centre is within the borough of Solihull, as is almost all of Birmingham Airport and the ever-expanding Birmingham Business Park. Alcott Wood in Moorend Avenue, Chelmsley Wood; 5.7 hectares (14 acres) of semi natural ancient woodland, designated in 2002. Babbs Mill in Fordbridge Road, Kingshurst; 24 hectares (59 acres) of mixed grassland, lake and woodland habitats, designated in 2000. Bills Wood, in Bill's Lane, Shirley; 7 hectares (17 acres) of semi natural ancient woodland, designated in 1991. Dorridge Wood, in Arden Road, Dorridge; 7.5 hectares (19 acres) of semi natural woodland, designated in 2000. Elmdon Park, at Elmdon Manor, Solihull; 4.6 hectares (11 acres) of former walled garden, managed by Warwickshire Wildlife Trust, designated in 1995. Jobs Close in Longdon Road, Knowle; 3.5 hectares (8.6 acres) of grassland and woodland with pond, designated in 2004. Palmers Rough, in Jacey Road, Shirley; 6.5 hectares (16 acres) of semi natural woodland, designated in 2000. Malvern & Brueton Park in Old Warwick Road, Solihull; 30 hectares (74 acres) of mixed grassland, woodland and marsh, designated in 2002. Millisons Wood, in Albert Road, Meriden; 11 hectares (27 acres) of semi natural ancient woodland, designated in 1993. Smiths Wood in Windward Way, Smiths Wood; 4.5 hectares (11 acres) of semi natural ancient woodland, designated in 2004. Yorks Wood, in Fordbridge Road, Kingshurst; 10 hectares (25 acres) of semi natural ancient woodland, designated in 1991. Other parks include Tudor Grange Park, Elmdon Park, Hillfield Park, Cole Bank Park, Knowle Park and Shirley Park. The nearest parks to the town centre are Malvern and Brueton Parks. They are interlinked and cover a total area of about 130 acres (0.53 km2). Brueton Park used to be part of the grounds of Malvern Hall, which dates back to about 1690. It is home now to St Martin's Independent School for Girls. Solihull also has the UK's first dedicated hedgehog conservation area. The River Blythe, a headwater tributary of the River Trent, passes through parts of Solihull including Malvern and Tudor Grange Parks. Solihull has numerous leisure facilities including a public swimming pool on the edge of Tudor Grange Park. This pool replaced the old Tudor Grange Sports Centre, which was demolished in 2007, to make way for the brand new leisure centre (A combination of the old Norman Green Athletics Centre and Tudor Grange Sports Centre). This in turn had replaced the outdoor swimming pool – Malvern Park Lido – that had served Solihull from 1954 till its closure in 1982. At present there are two sports centres, the more modern Tudor Grange Sports Centre, and the older North Solihull Sports Centre. There is also an outdoor wooden skateboarding and in-line skating facility in Tudor Grange Park. Sailing takes place on Olton Reservoir. The borough is well served by numerous youth groups, both from the statutory and voluntary sector. There are several Scout groups including Knowle Sea Scout Group which is based in the south of Solihull and is sponsored by the Royal Navy providing a wide programme of activities for young people from all over Solihull aged from 6 to 18. The recently refurbished ice rink on Hobs Moat Road is home to Solihull's ice hockey teams, the Solihull Barons, Solihull Vikings, a junior ice hockey team, the Mohawks ice racing club, as well as ice dance and figure skating clubs. Above the ice rink is a Riley's snooker club. Every year since the early 1930s (apart from gaps during world wars), Solihull Carnival has taken place. This is now fixed to the first weekend after the June half-term and takes place in Tudor Grange Park, organised by Shirley Round Table. The event raises about £10,000 for charitable causes each year. Tudor Grange Park is also the venue for the annual free firework display held on the Saturday closest to 5 November, organised by Solihull Round Table. The event attracts about 15,000 people to the park. The largest football club in the town is Solihull Moors, who play at Damson Park, 2 miles (3.2 km) from the town centre. The club was established in 2007 following the merger of Solihull Borough and Moor Green and currently play in the National League after being promoted from the National League North at the end of the 2015-16 season. Birmingham & Solihull R.F.C., known as "the Bees", a professional rugby union team which competes in National League 3. The club played at Sharmans Cross Road until August 2010, and following a brief spell at Solihull Moors' Damson Park ground the club now play at Portway. Solihull Swimming Club is based at Tudor Grange Leisure Centre, Solihull School and St. Martin’s School. First established in 1963, the club now boasts over 600 members and also runs water polo teams. Solihull Barons are the local ice hockey team and play their home games at the Solihull Ice Rink. Solihull also has a number of field hockey clubs, namely Old Silhillians Hockey Club, Olton & West Warwickshire Hockey Club and Solihull Blossomfield Hockey Club. Gaelic games are played by Warwickshire GAA who play their home matches in Páirc na hÉireann in Solihull. The town has an indoor bowling area and club. 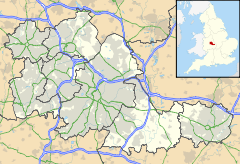 Solihull town has several suburbs including Olton, Solihull Lodge, Blossomfield, Haslucks Green, Sharmans Cross, Cranmore, Shirley (considered a sub-town of Solihull), Shirley Heath, Hillfield, Monkspath, Widney Manor, Lode Heath, Elmdon Heath, and World's End. Solihull Borough includes several satellite towns and villages including Castle Bromwich, Chelmsley Wood, Cheswick Green, Dorridge, Dickens Heath, Knowle, Balsall Common, Meriden, Hampton in Arden, Hockley Heath, Eastcote, Barston, Bickenhill, Catherine-de-Barnes and Bentley Heath. This list includes notable persons who were born or have lived in Solihull. Karren Brady (b. 1969), vice-chairman of West Ham United F.C. Tommy Godwin (1920-2012), cyclist, twice Olympic medallist in 1948 and President of Solihull Cycling Club. Will Grigg (b. 1991), English-born Northern Irish professional footballer. Stephen Walters, actor, lives in Solihull. Jon "Fox" Davies (b. 1998), Professional rugby player for the Scarlets, Wales and the British and Irish Lions. ^ "Local Authority population 2011". Archived from the original on 23 December 2015. Retrieved 15 December 2015. ^ "Solihull is streets ahead in region's property rich list". Archived from the original on 21 October 2017. Retrieved 7 July 2017. ^ "uSwitch News: Solihull 'best place to live' in UK Quality of Life Index". Uswitch.com. Archived from the original on 6 October 2014. Retrieved 14 August 2014. ^ Heather Saul (14 November 2013). "Ten best places to live in the UK: Solihull comes top". The Independent. London. Archived from the original on 10 August 2014. Retrieved 14 August 2014. ^ Historic England. "Details from image database (218304)". Images of England. Retrieved 19 September 2007. ^ "Arden Golf Club, Solihull, Wawickshire". Golfsmissinglinks.co.uk. Archived from the original on 3 April 2015. Retrieved 14 August 2014. ^ "Local History - Charter Day". Archived from the original on 22 February 2013. Retrieved 6 March 2013. ^ a b "Solihull Website - Council Structure". archive.org. 26 September 2007. Archived from the original on 26 September 2007. Retrieved 8 May 2018. ^ a b c d e f g h i j k "Solihull Council Local Nature Reserves". Archived from the original on 30 June 2011. Retrieved 4 April 2011. ^ "Helping hedgehogs around the UK - The Wildlife Trusts". www.wildlifetrusts.org. Archived from the original on 26 March 2018. Retrieved 8 May 2018. ^ "Get ready for Solihull's Bonfire Night in Tudor Grange Park". Solihull News. 3 November 2011. Archived from the original on 11 September 2012. Retrieved 4 November 2012. ^ "Solihull Swimming Club". www.solihullswimmingclub.co.uk. Archived from the original on 17 March 2018. Retrieved 17 March 2018. ^ "Club History". Solihull Cycling Club. Archived from the original on 27 September 2016. Retrieved 24 September 2016. ^ Whiting, David (2009). Modern British Potters and their studios. A&C Black. ^ "Solihull Arts Complex". solihullartscomplex.co.uk. Archived from the original on 28 October 2014. Wikimedia Commons has media related to Solihull.